I needed a pulsating light for a certain signaling. Voltage was 230V. So I decided to make a simple circuit, consisted of a LED diode, two capacitors, two resistors, a diac and a diode. 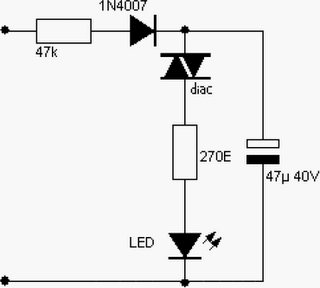 Activity of the circuit is extraordinarily simple. 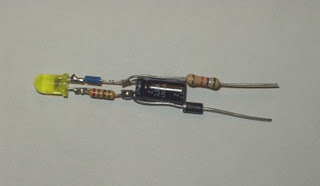 The capacitor charges by the diode and the resistor. When the voltage on the capacitor achieves 30V the diac "releases" the electrical tension and the capacitor empties thorough the diac, LED blinks. Time base is dependent from the capacitor and the resistor, which is in series with diode 1N4007. Capacitor must be at least for 40V.